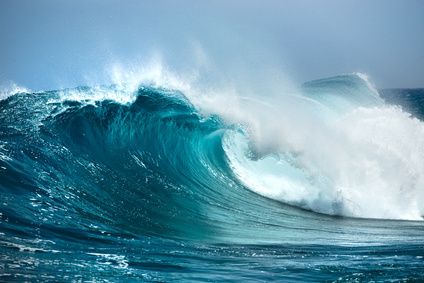 In a way, wave power can be seen as just another form of wind power, since most waves are created by winds blowing on the surface of the water. As the world searches for more sources of renewable energy, wave power has gotten more and more attention. One of the biggest advantages of wave power is that it is one of the most renewable energy resources on the planet. It's not always there in great strength, but waves ebb and flow every day of the year, come rain or shine. The real challenge in converting waves to usable electric power lies in capturing the energy inherent in waves in the most efficient and economical manner possible, and then channeling it into the existing power grid. Since wave action is a power source that is generated every day, albeit in greater or lesser quantities, the primary issue with capturing this energy is how it is accomplished. Wave-powered generators come in a variety of types, but they all do essentially the same thing, which is capturing the kinetic energy inherent in wave motion so that it can be converted into electrical power. One type of wave generator is the wave buoy. As it bobs up and down, internal devices capture the vertical kinetic energy in the waves, forcing pressurized seawater upwards to turn a small turbine that generates electricity. The buoys can be arranged in clusters, referred to as wave parks, which are generally located a mile or two offshore. The clusters of buoys are connected with cables so that they do not drift apart. The electrical power generated by the internal turbines is then transmitted via undersea cables to a connection with the power grid onshore. Depending on the energy needs of the onshore community near the buoys, the wave parks can be scaled up to contain a large number of clusters. One of the advantages of this method of collecting wave power is that even large numbers of buoy clusters would not be too unsightly because they are mostly underwater and they are far enough at sea as to not be too easily visible from the shoreline. One of the criticisms of generating power via seaborne wind turbine "farms" is that the turbines are thought by many to be a visual blight on the horizon. Another type of buoy that offers the promise of collecting large amounts of wave energy is the "Pelamis", a long, vertical buoy manufactured by Ocean Power Delivery LTD of Edinburg, Scotland, that generates power from the swell of the waves. The way the Pelamis works is startlingly simple: it consists of long, partially submerged sections that resemble sections of a submarine. Wave action causes the Pelamis to bend between the sections. This flexion moves hydraulic pistons inside the device that push fluid in a linear direction to generate energy. The manufacturer estimates that a one square kilometer farm could generate 30 megawatts of power. This system can easily be deployed in deep ocean regions as a series of Pelamis farms since sea swell occurs almost everywhere the ocean exists. Another promising method of capturing the kinetic energy in waves is also one of the oldest: The LIMPET (Land Installed Marine Powered Energy Transformer); it is manufactured by Wavegen, and the earliest example (in service since 2001) can be found on the island of Islay, just off the West Coast of Scotland. Its design enables the LIMPET to funnel waves into a channel that pushes air pressure past a pair of turbines. Each of these turbines powers a 250-kilowatt generator. The LIMPET's ingenious design puts all moving parts and all the generators above the water line, thereby making it easier to service and maintain these mechanisms. On the downside, this design is not aesthetically pleasing, and it's rather noisy when it's operating, two factors that probably annoy anyone who lives in the vicinity. Still, for an energy-generating device that employs an infinitely renewable source of power and doesn't pollute the atmosphere, its virtues far outweigh any of its minor flaws. An even more ingenious and far more aesthetically pleasing design comes from WaveEnergy of Norway. Its graceful design consists of an array of carefully designed reservoirs layered in a sloping configuration specifically designed to collect the kinetic energy in the waves, which is then used to turn a turbine or generator. It's an elegant idea, both in appearance and in its functionality. If a 500-meter long breakwater using these principles is built, it could potentially generate around 150 kW. But because the design is so new, a working commercial model has yet to be put into service. But imagine the vast amounts of power breakwaters like this would generate if they were put into place all over the world. The designs and concepts described here are, fortunately, only the tip of the iceberg when it comes to capturing wave-derived energy. Wave power is, as yet, a vastly under-used resource. There are enough concepts and actual working devices that haven't been discussed yet in this forum to allow for a sequel to this article. Stay tuned for future installments on wave power.